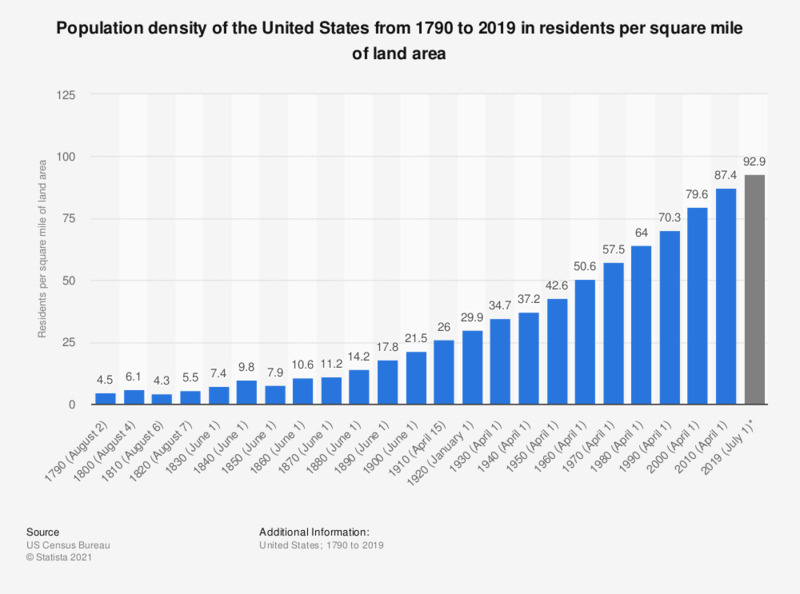 This graph shows the population density of the United States of America from 1790 to 2018. In 2018, the population density was approximately 92.6 residents per square mile of land area. Population density has been tracked for over two hundred years in the United States. Over the last two centuries, the number of people living in the United States per square mile has grown from 4.5 in 1790 to 87.4 in 2010. After examining the data in detail, it becomes clear that a major population increase started around 1870. Population density was roughly 11 at the time and has doubled in the last century. Since then, population density grew by about 16 percent each decade. Population density doubled in 1900, and grew in total by around 800 percent until 2010. The population density of the United States varies from state to state. The most densely populated state is New Jersey, with 1,211 people per square mile living there. Rhode Island is the second most densely populated state, with a bit more than 1,000 inhabitants per square mile. A number of New England states follow at the top of the ranking. The northeastern region of the United States is the most densely populated area by far. The least populated U.S. state is, to no surprise, the vast territory of Alaska. Only 1.3 inhabitants per square mile reside in the largest state of the U.S. Compared to other countries around the world, the United States does not rank within the top 50, in terms of population density. Most of the leading countries and territories are city states. However, the U.S. is one of the most populous countries in the world, with a total population of over 325 million inhabitants, as of 2017. * Data for 2017 are estimates based on the census population estimates, accessible here, and using the 2010 census land area. Area figures represent area on indicated date including in some cases considerable areas not then organized or settled, and not covered by the census. Area data include Alaska beginning in 1870 and Hawaii beginning in 1900. Total area figures for 1790 to 1970 have been recalculated on the basis of the remeasurement of states and counties for the 1980 census, but not on the basis of subsequent censuses. The land and water area figures for past censuses have not been adjusted and are not strictly comparable with the total area data for comparable dates because the land areas were derived from different base data, and these values are known to have changed with the construction of reservoirs, draining of lakes, etc. Density figures are based on land area measurements as reported in earlier censuses. Everything On "Demographics of the U.S. Part I" in One Document: Edited and Divided into Handy Chapters. Including Detailed References. Statistics on "Demographics of the U.S. Part I"